Earwigs are outdoor insects usually found in damp areas, such as under mulch, dead leaves, logs, and piles of firewood, boards, stones and other debris or in rotted wood where they feed on moist, decaying plant material. Though earwigs occasionally attack living plants, including vegetables, flowers and ornamental plants, they are considered only minor pests. The earwig is a household pest as an accidental invader. They enter houses either by accident or when seeking shelter, especially in the fall or during periods of prolonged dry weather. Earwigs inside the house do not cause any harm or destruction. They are an annoyance or nuisance because of their presence. If disturbed, earwigs may produce a noticeable foul odor. 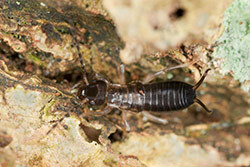 Earwigs found inside the house can be swept or picked up and discarded. Indoor treatment with household residual insecticides such as for cockroaches could be used in cracks and crevices that serve as points of entry, and along baseboards, window sills and door thresholds.